New treatments – With equipment from IONTO-COMED’s EXCLUSIVE LINE, successfully treat your customers whose wishes cannot be fulfilled with care products alone. Satisfied customers – Visible results, sustainably improved skin. Acquire new clients – Expand your range of treatments and as a result acquire new clients. Secure a unique selling point – Distinguish yourself from your competitors through professional offers with beauty equipment and enhance your image as a beauty expert. Generate recommendations – Always be on the cutting edge of possibilities – the premium cosmetic equipment in IONTO-COMED’s EXCLUSIVE LINE will emphasize your skills and help you to give the best treatments that you have ever done. Thus, you can easily get your clients to recommend you. The use of ultrasound at 10 MHz works specifically in the uppermost layers of the skin and can regulate inflammatory and highly inflammable processes and improve the skin structure. In particular, the upper skin cells are activated by the negative pressure phases and stimulated to regenerate the skin - the result is a comprehensive skin image improvement with visible success! The AQUAsonic spatula transmits low frequency ultrasound waves* onto the skin’s surface with the AQUApeel function Similar to the disinfection process in an ultrasonic bath, the AQUApeel completely removes excess particles with its targeted vibrations. The treatment’s effect on the skin: In combination with the AQUApeel lotion, make up residue, cornification, dead cells, scabs and residue from silicon-based care products are gently and inimitably thoroughly removed. The deep peel with low frequency ultrasound is esteemed due to its diverse effects, even in medicine. This treatment not only peels, it has also proven to increase the skin’s tissue repair without damaging it. 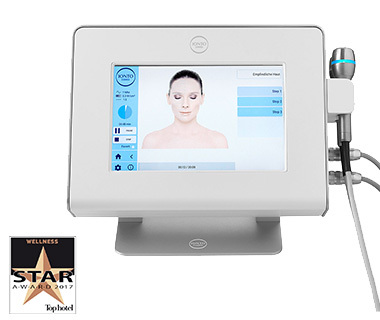 The AQUAsonic hand piece moves evenly over the skin with the SONICrepair and SONICrevital treatments. That’s how the low frequency ultrasound waves are transmitted over a full surface in the depths of the skin. The effect: The so-called ‘mass detection’ of particles is significantly higher with low frequency ultrasound than it is with conventional high frequency ultrasound equipment (1 and 3 MHz). This means that the mechanical effects and penetration of active substances is very strongly pronounced. Gentle skin resurfacing – for skin as soft as silk. 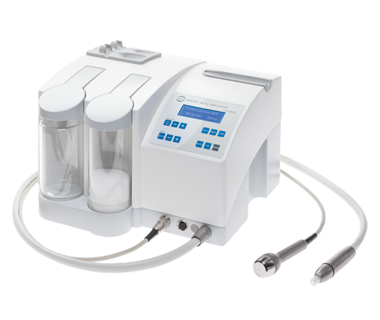 IONTO-COMED’s microdermabrasion methods remove fine, highly purified crystal particles from the stratum corneum (outer most layer of the epidermis containing dead skin cells) in an effective and controlled way. Your client’s skin will immediately look fresher, rosier, brighter and younger. Active substances are optimally absorbed in high quantities. The fascinating impact of this beauty method unfolds deep in the skin: The skin regenerates its self and beautifies from inside out! Deeply effective tightening and micro massage. 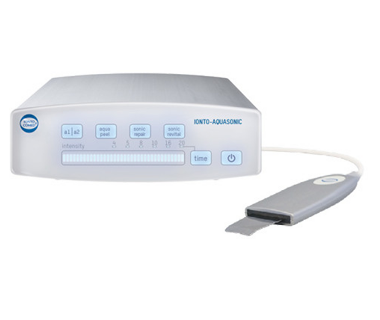 IONTO-COMED’s ultrasound treatment works in three ways: Heat treatment, micro massage and penetrating phonphoresis in one. Connective tissue is tightened, the skin cells capacity for absorbing active substances is increased many times over and micro circulation is increased. For a visibly effective treatment and smooth skin. 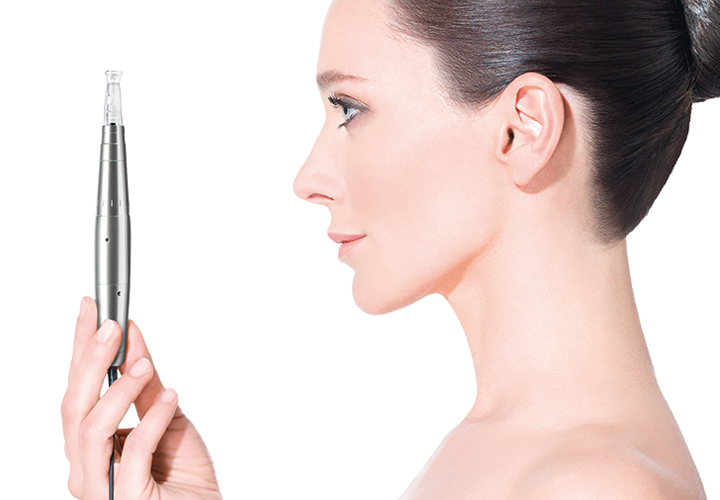 Ultra-fine MESO injections punch micro openings into the epidermis. Your natural protective function remains intact. The MESO injections move fully automatically back and forth, similar to a stamp. Thus, the epidermis is penetrated precisely and evenly. Completely pain-free, gentle and smooth. Concentrated active substances, even on a macromolecular basis, penetrates directly and evenly. The skin is therefore not just optimally cared for, it also regenerates itself from the inside out. 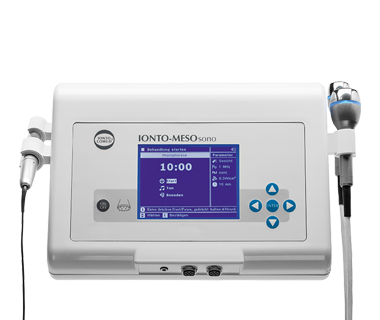 IONTO-COMED’s ultrasound treatment works in three ways: Heat treatment, micro massage and penetrating phonphoresis in one. Connective tissue is tightened, the skin cells capacity for absorbing active substances is increased many times over and micro circulation is increased. For a visibly effective treatment.